Having just seen Charlie Sheen interviewed on Katie Couric’s show today (2/6/13), it seems that the crazy-as-heck Sheen from 2011 is—for better or worse—in the rear view mirror. He’s fully coherent, very generous with compliments, and grateful to have been allowed the opportunity to rebuild his career. But for a short spell back in ‘11, the Sheen madness—bizarre interviews with anyone willing to have him on their show, the angry webcasts, the eventual stand-up/trainwreck live tour—was just about the most entertaining and fascinating thing coming out of Hollywood at the time. His meltdown, whether you found it funny or embarrassing (or somewhere in between), had the golden benefit of being truly unpredictable. 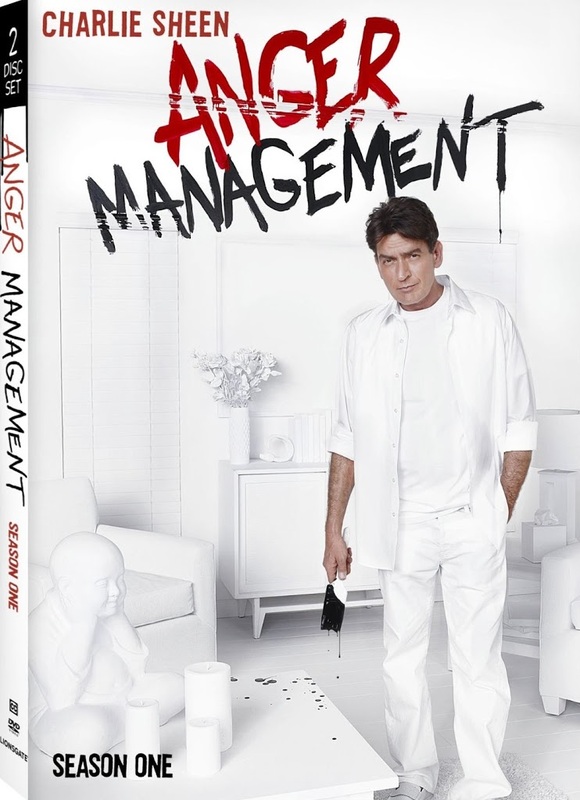 The FX sitcom Anger Management, at least based on the ten-episode first season now available on Blu-ray and DVD, does not share that quality. In fact, after sitting through all ten in one sitting, I was a little shocked by how conventional and utterly safe Sheen decided to play it. Based very loosely on the 2003 Jack Nicholson and Adam Sandler comedy of the same name, Sheen stars as Charlie Goodson. Having once lived with an on-going anger management problem, the former major league baseball player became an anger management therapist himself. Charlie continues to see a therapist to keep his anger in check—but that therapist also happens to be the woman he sleeps with (though doesn’t regard officially has his girlfriend), Kate (Selma Blair). Also a heavy, on-going factor in the series is Charlie’s ex-wife, Jennifer (Shawnee Smith), and their OCD-afflicted teen daughter, Sam (Daniela Bobadilla). Charlie interacts with these series regulars from episode-to-episode, keeping tabs on his ex’s love life while trying to help Sam deal with adolescence. His patients are recurring presences as well, with the saucy Lacey (Noureen DeWulf), cranky senior Ed (Barry Corbin), and gay Patrick (Michael Arden). I only mentioned the latter’s orientation because it is part of the show, with Ed taking frequent potshots at him for it. “Conventional and safe” doesn’t necessarily translate to “without entertainment value.” Anger Management, again based solely on the first season since I’ve not seen any of the in-progress second season, is really just okay, with an abundance of corny humor emphasized by a startlingly loud laugh track. But Sheen remains a reliable pro, elevating the average one-liner to a marginally higher level. But he could certainly do much better with funnier material. Hopefully that’s what’s in store for the 90 episodes FX renewed the series for (though the noticeably sagging ratings for season two don’t seem to reflect that). Selma Blair is the highlight of the supporting cast, with her offbeat comic timing. Martin Sheen gets laughs in episode nine (“Charlie’s Dad Visits”—all the episode titles begin with ‘Charlie’) and has since joined the cast for the second season. The DVD contains a couple of featurettes, one is a compilation of cast and crew interview clips (“Charlie’s Baby”) and the other features members of Charlie’s therapy group (“Behind the Couch: Meet Charlie’s Patient”). More interesting is a funny reel of outtakes. I don’t usually find much to laugh at in gag reels, but this one has some very amusing bits (including Daniela Bobadilla struggling to correctly pronounce the name Beauregard). As a trial run, the ten-episode Anger Management – Season One gets by primarily on the charisma of Charlie Sheen. It’ll need to expand on its concept to be sustainable for the planned 90 episodes over the next two years. That said, it sure could’ve been a lot worse. I can’t help but feeling that the movie by Anger management by Adam Sanlder and Jack Nicholson was much better than this TV series. They should have thought of other titles though. Based on my studies from counselling fulham, I think watching movies based on human nature faults for patients gives them much more awareness on what they are dealing with. I would definitely agree with the corny part!!! I am not sure this will hold a candle to the Anger Management movie but I think it will be a witty, funny show. We’ll see how it all plays out.